Julie is the victim of a bank robbery. Shane and Danny crash their car. The doctor tell Max and Maria that Shane will be fine, but there's damage to his spinal cord. Max is standing over Shane when he wakes up. He's flat on his back. He immediately asks about Danny. A doctor comes in and explains that Shane has broken a few ribs - it's why it's difficult to breathe. Danny is telling Maria that he had dreamt about the accident. Maria tries to reassure him. Maria goes off to see Shane. 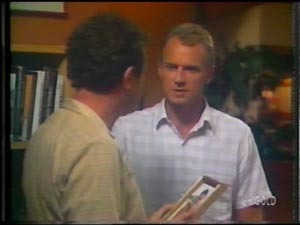 Max goes in to talk to Danny. He asks awkwardly if Danny is alright then goes back to Shane. Danny calls him back and begs Max to tell him the truth about Shane. Max tells him that Shane has a ruptured spleen and spinal damage - he might not walk again, let alone dive. Danny says it should have been him - it wouldn't have mattered so much. Max doesn't disagree. Daphne has arrived in the hope of seeing Shane. Max and Maria explain Shane's injuries. The doctors are trying to get Shane to move his hands and feet, but he can't. 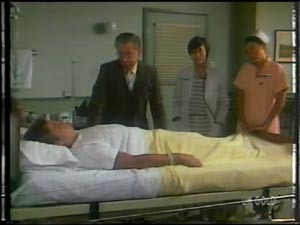 A Chinese-looking doctor insists Shane isn't paralysed, it's just bruising. When the doctors have gone, Daphne comes in. She kisses him and jokes he'd better not drag her into the hospital bed with him! SHANE: THey've just told me I won't be diving again. The doctor is telling Max and Maria that Shane will be alright with some physiotherapy - but he shouldn't dive ever again because it might paralyse him permanently. Shane will have to rethink his life - anything strenuous is out. Daphne is telling Shane cheerfully that now he can plan lots of new things - like getting married and stuff. Shane says he's not interested, even when Daphne hints that she is! When Daphne has gone, the nure comes back. NURSE: She seems nice. Is she your girlfriend? Scott has decided to go back to school and Helen is very pleased. Scott is worried about Danny and Shane though. Scott wonders if he should go and see Danny - he wishes they hadn't fought now. Helen advises him to tell Danny that. Shane has sent a message that he wants to see Danny. But Danny doesn't want to see him - he says he doesn't feel up to it. Danny has not touched his dinner. Scott comes in to visit Danny - (Danny's got broken ribs and a few stitches.) Scott eats some of Danny's meal since it's going begging(!) He apologises about the fight and sits down to chat to Danny. Danny is quite unforthcoming. He tells Scott he'd thinking of shooting through after this - he asks Scott if he wants to come with him up North. Daphne is watching the news. There are articles about the bank robbery and Shane and Danny's accident. Des comes in. Daphne is looking very down - she says Shane is putting on a brave face but he still can't move his legs. Des tries to encourage Daphne - saying these things take time and Shane is a real fighter. Scott tells Helen that Danny blames himself for the accident. He says that Danny might do something stupid like running away. Julie is having a lie-down - she is finding it hard to come to terms with the bank robbery. Max is clearly very upset about Shane but is bottling it up. They chat about the bank robbery. Then Max starts to cry, saying that Shane could have made the Olympics. Jim says that at least the boys are alive. Max says that Danny thinks it should have been him being injured - and he was right. Max is upset that he's been thinking that way. Jim can't understand what Max has against Danny - he's a bit wild, but he's a really nice kid underneath. He says that Danny used to come and unburden himself to Jim, but he doesn't anymore - he's clammed up. Jim says maybe Danny reminds him too much of himself - Max used to be a ratbag himself as a kid. 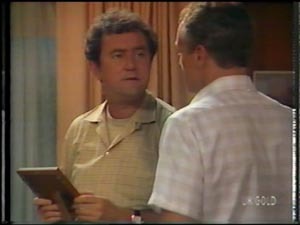 Max gets cross and says Jim doesn't know what he's talking about. He heads off back to the hospital. Jim comes to see Des about Julie - she's crying that she doesn't want to go to work. Des says he'll go and have a word with her. Daphne comes in and tells Des she's sorry she hasn't been home all night. Des doesn't comment and says he'll see her tonight. They smile at each other. Maria has brought a picnic for her and Danny. Danny says he's not hungry. 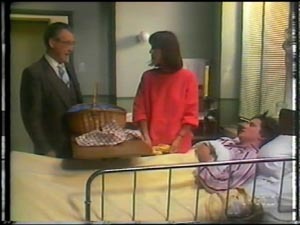 The Chinese-looking doctor tells Danny that either he eats or they'll have to put an intravenous drip into him. Danny starts to cry and says it should have been him, not Shane. The doctor tells Shane that Danny is blaming himself for the accident. Shane thinks he's being silly and can't believe Danny won't come in and see him. The doctor shakes his head and tells the doctors to start feeding Danny intravenously. Danny tells Shane that he's his brother and he's the only one he can turn to.